A step-by-step tutorial on how to draw realistic corset lacing. The example shown is a Victorian corset that laces up the back, but the techniques can be adapted for any kind of crisscrossed lacing, whether that's a corset, or shoe laces, or a ribbon-laced bodice. 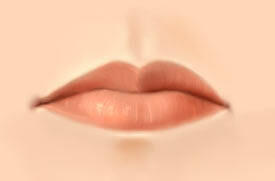 While this demo was made using Photoshop Elements, you can use any digital paint program to achieve the same results.